The 2013 TD Five Boro Bike Tour regular registration will be a “rush” registration system, on January 22, beginning at noon. The 2013 TD Five Boro Bike Tour regular registration is similar to 2011, where the Tour’s first-come, first-serve registration system – 32,000 places – sold out in less than 24 hours. 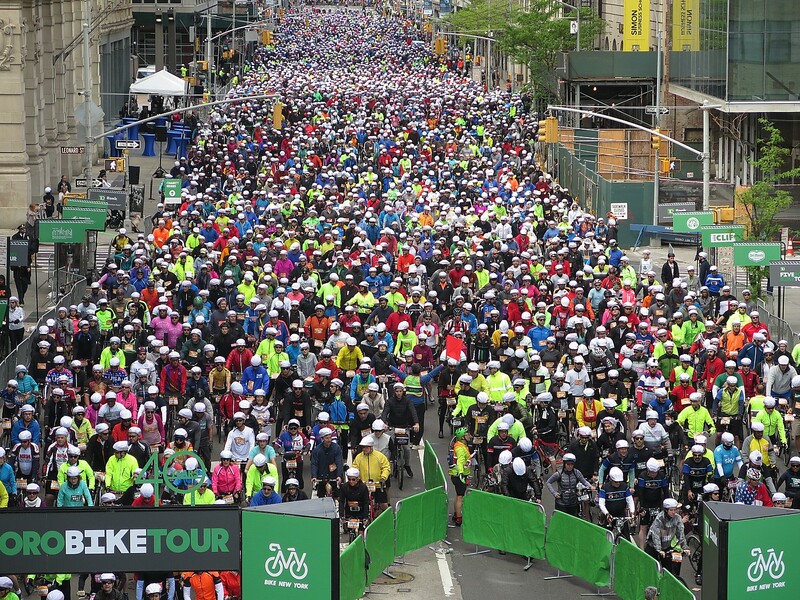 Bike New York anticipates a similar sellout for the 2013 Tour, which will take place on Sunday, May 5. Those interested in participating in the TD Five Boro Bike Tour will have the opportunity to register starting on January 22 at noon EST. Adults must register themselves individually. Youth registration will take place in conjunction with an individual adult registration. All youth registrations must maintain a one child to one adult ratio. Participants hoping to ride with friends and family will have the opportunity to link their registrations together after the event sells out. Visit the registration page for additional details. Bike New York, in partnership with the Giro d’Italia, is adding a new way to ride the TD Five Boro Bike Tour. This new VIP registration option will give riders the chance to test their limits, with a timed climb up the Verrazano Bridge. In addition, all Giro riders receive an exclusive Italian-made Gran Fondo Giro d’Italia New York City jersey to wear during the event. Gran Fondo Giro d’Italia New York City registration opens on January 22 at 12:00 p.m. EST. It is only available for riders 18 years of age and older. Visit our registration page for additional details. 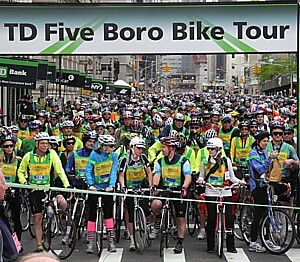 All 2013 TD Five Boro Bike Tour participants will pick up their rider packet and Tour vest at Bike Expo New York (BE NY). Located at Basketball City on Pier 36 (along South St. at Montgomery St., Manhattan, NYC), BE NY will take place the two days before the Tour, Friday, May 3 and Saturday, May 4. Free and open to the public, the BE NY provides an opportunity for residents and visitors to celebrate all things bicycling against the backdrop of New York. Regular registration and the Gran Fondo Giro d’Italia New York City are not the only ways to ride in the 2013 TD Five Boro Bike Tour. Prospective riders can also “Ride for a Reason” and champion one of Bike New York’s 43 charity partners. Last year’s ‘Ride for a Reason’ charity program raised more than $1.1 million for partner charities! Visit the Ride for a Reason webpage for additional information and a list of charity partners! Those who do not get into the 2013 TD Five Boro Bike Tour can guarantee an entry spot into the 2014 Tour by volunteering this year during Tour weekend or Bike Expo New York. Bike New York volunteer applications will be online in January. Visit the volunteer page for more information. Held annually the first Sunday in May, the TD Five Boro Bike Tour is America’s largest cycling event with a 40 mile, car-free ride through all five boroughs for 32,000 cyclists. The Tour is co-produced by Bike New York, the city’s premiere bicycling not-for-profit organization, and the New York City Department of Transportation, in association with multiple City of New York departments. Proceeds from the event fund Bike New York’s education programs. For more information, e-mail info@bikenewyork.org, phone 212-870-2080 or visit http://www.bikenewyork.org.